Welcome back to our blog page here at Class Inc.! As the nation’s best source for quality vacancy solutions, we’re gearing up for some of our busiest times of the year: the end of the summer. There is a reason why this is a chaotic time for our team and it often starts and ends with college students. As we approach the end of July, college students all around the country are seeking their homes for the school year. Whether you live in a city with multiple colleges and universities or you have one school that your area is known for, you want to make sure that you’re ready for the influx of residents who need a place to stay. College students aside, the summertime is simply the season for relocating and if you have apartments that are sitting empty, this is your chance to market to the kind of residents that you want to live in your units. Whether you’re trying to reach young couples or young families, you will definitely need our help selecting the right people, screening them, and running the whole process of renting. If you’re ready for Class to step up and step into your rental situation, contact us today. We’d love to get you started with an expert leasing agent today! 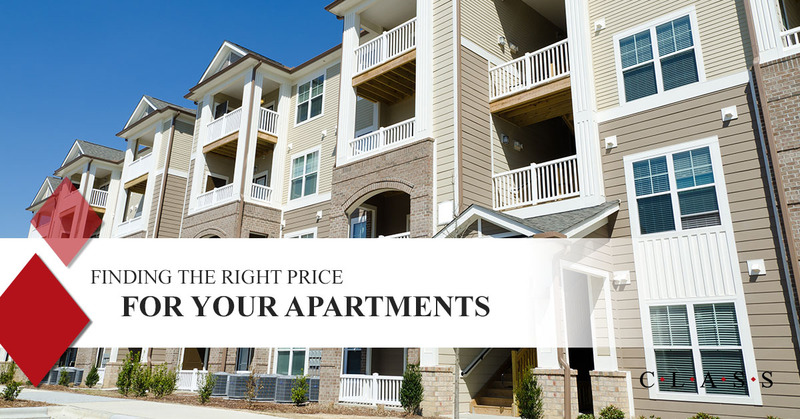 One thing that often keeps people from choosing a certain apartment complex or apartment community is the price. If the price is too high, people will steer clear of renting from you because they won’t be convinced that the amenities or the dwelling is worth the high price. If your prices are too low, people might assume that there is something that they might be missing. They’ll quickly look for “what’s wrong” with your apartments. There are a few things to remember when it comes to choosing the right price for your apartment community or multi-family dwelling. Let’s dive into some of the most significant factors that should help determine your prices. Not that you’re going to do everything exactly like your biggest competitors, however, you’ll want to take a note out of their book, especially if they’re achieving success. Take a look at what they’re offering for the prices that they’re charging. If they’re offering fewer amenities than you and their apartments are similar to yours but your prices are lower than theirs, you might need to raise your rental prices a bit. If you’re looking at your competition and they don’t seem to be doing well, try and see if you can detect the problem. This all requires research, but you’ll be better off for getting to the bottom of it. The current market can help you determine what you should be charging for rent. Certain places in the nation are able to charge more for rent because of the location. An apartment in Los Angeles might cost $3000 per month while an apartment of the same size and condition in small-town Nebraska might only run $500. Staying relevant on the market trends will help you determine the right price for your units. Our apartment vacancy solutions are second to none. If you’re considering reaching out to a leasing agency, there’s never been a better time to do so. To learn about our leasing process here at Class or to get started with the process, reach out to us today!